Having met Bryn Thomas on the Intro to Permaculture course, conversation turned to regenerating public places by planting fruit trees. I mentioned that I was Chairperson of Craven Vale Community Association, and perhaps we could get around to planting some fruit trees on a council estate in Brighton. Some funding was made available through the Local Fruit Futures Project, so in the winter of 2009-10 we planted eight trees on the Craven Vale estate. The trees that we planted comprised of two plums – Marjories Seedling and Dennistions Superb, both on St Julien A rootstocks – a fig tree called Brown Turkey, and five Sussex varieties of apple – Nanny, Golden Bounty, First and Last all on M25 root stocks, Aldwick Beauty and Dr Hogg on M111 root stocks. All the trees were watered in the first year, and, other than some of the apples having problems with rosy red apple aphid (the lady bird larvae feasted on them), the trees survived well. We sent a couple of residents on Brighton Permaculture Trust’s community orchard Training course, giving the residents sufficient knowledge to become orchard leaders and look after the trees in the first couple of years of growth. Save rare Sussex apple trees. Attract wildlife and beneficial insects. 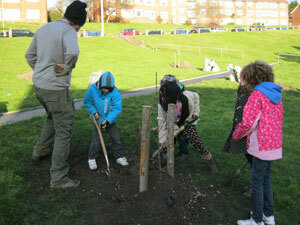 Get the community involved with planting and looking after the trees. Promote carbon sequestration in the trees and soil. 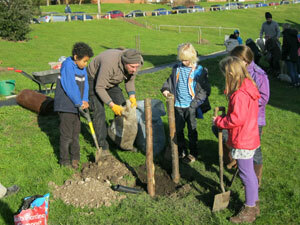 The funding was made available through Brighton Permaculture Trust. Additional funding was from The Big Tree Plant and Harvest Brighton & Hove. It was decided that we would plant the forty trees over a two year period: twenty one year and twenty the next. In January 2012 we started planting the first trees with the help of residents from the Craven Vale estate and school children from St Luke’s School. The Argus covered the event..
To see a map of all the trees planted, click here. 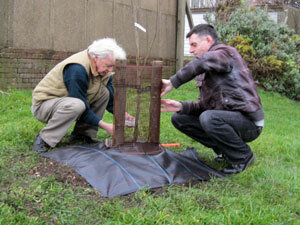 Get more information about planting a community orchard in your area.